On September 30th, 2018, when tens of thousands of bikers around the world don their finest threads for the “Distinguished Gentleman’s Ride”, there’s a good reason for it: events in more than 650 cities are aiming to raise money for a good cause. The organisers expect to raise around $ 6 million, which will be spent on fighting prostate cancer and raising awareness of depression and suicide in men. This would be about 20 times as much as was raised five years ago. The first time the Ride took place in 2012, participants raised $ 277,000. It has been an annual event ever since. 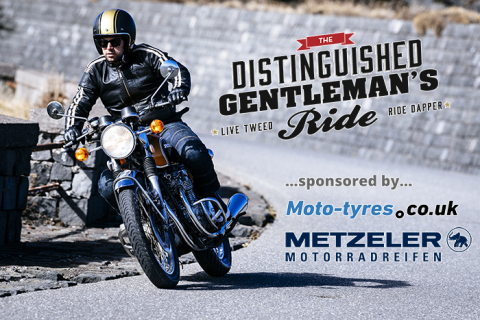 It goes without saying that Delticom’s two-wheel division with its online shop Moto-tyres.co.uk will once again be sponsoring the "Distinguished Gentleman's Ride" this year. The online motorbike shop from Europe's largest online tyre retailer is sponsoring events in Hamburg, Munich, Paris, Amsterdam, Rotterdam, Antwerp, London, Copenhagen, Milan and Madrid with a total of $ 5,000. But it’s not just companies that can raise money: each and every biker can donate by registering and supporting the event with a donation of their choice. Or simply by mounting their bikes and raising money themselves by taking part in one of the many Rides. As an additional incentive: In each city where Moto-tyres.co.uk is sponsoring a Ride, the biker who raises the most money will receive a set of (front and rear) Metzeler tyres from the online shop free of charge. For more information, go to https://www.moto-tyres.co.uk/gentlemans-ride-2018.html. The "Distinguished Gentleman's Ride" is also interesting for spectators, as the bikers wear smart clothes such as silk waistcoats and tweed suits, and ride elegant motorbikes such as choppers, cafe racers and classic scooters. Australian Mark Hawwa, creator of the event, also requests good manners on that day. While around 2,500 drivers participated in 2012, by 2017 this had grown to 94,000. This year, organisers are expecting 120,000 men and women to actively participate in the campaign. Currently, about 40,000 participants have already registered and a quarter of the target sum has been raised. The Distinguished Gentleman's Ride is not only about fighting prostate cancer, but also about preventing suicide, which has been on the increase in many countries for several years. "This is a very serious, important topic. We are happy to be able to raise awareness of it as part of the campaign this year, and to raise money for a good cause together with tens of thousands of bikers,” says Oliver Pflaum, Head of Sales for motorbike tyres at Moto-tyres.co.uk. Go to www.gentlemansride.com/rides for a world map showing all the cities where a charity ride is taking place. Whether you're looking for chopper, sport-touring or scooter tyres: bikers will find everything their heart desires in this renowned online store's range. Accessories such as bike tubes and motor oil complete Delticom's bike range. The two-wheeler tyre specialist's portfolio includes all established premium bike tyre manufacturers such as Metzeler, Pirelli, Continental, Dunlop, Bridgestone and Michelin, as well as renowned quality brands such as Heidenau, Avon, Maxxis and Mitas. Further online stores in Europe: www.motorradreifendirekt.de (DE), www.motorradreifendirekt.at (AT), www.motorradreifendirekt.ch (CH), www.pneus-moto.fr (FR), www.motorbandenmarkt.nl (NL), www.moto-pneumatici.it (IT), www.neumaticosdemoto.es (ES) and more.